To determine the correlation between mesopic retinal sensitivity and optical coherence tomographic metrics of the outer retina in patients with intermediate age-related macular degeneration (AMD). Participants with nonatrophic dry AMD underwent mesopic MP-3 microperimetry (Nidek, Padova, Italy) and both Nidek and Cirrus (Carl Zeiss Meditec, Dublin, CA) spectral-domain optical coherence tomography (SD-OCT). The volume of the outer retinal layers was measured on the Nidek SD-OCT scans using the automatic segmentation algorithm of Navis-EX software. In addition, drusen area and volume within a 5-mm circle centered on the fovea were determined using the Cirrus Advanced RPE Analysis Tool. The mean retinal sensitivity at 8° and 10° of fixation (5-mm and 6-mm circles) was calculated for every eye. The correlation between retinal sensitivity and patient age, outer retinal layer volume, drusen area, and drusen volume was assessed. Thirty-seven eyes from 25 patients with non-atrophic dry AMD were included in the study. The mean age of the patients was 76 years ± 9 years. The mean sensitivity across the whole tested retinal area was 24.9 dB ± 2.4 dB, with a sensitivity of 25.1 dB ± 2.4 dB within the central 5-mm circle. Drusen area within the central 5-mm circle was 0.7 mm2 ± 0.89 mm2 with a drusen volume of 0.03 mm3 ± 0.04 mm3. Retinal pigment epithelium and photoreceptor outer segment (RPE + OS) volume was 1.96 mm3 ± 0.1 mm3, and outer nuclear layer (ONL) volume was 1.91 mm3 ± 0.17 mm3. There was a significant correlation between RPE + OS volume and retinal sensitivity, as well as between patients' age and retinal sensitivity. There was no significant correlation between drusen area or volume and retinal sensitivity, nor between ONL volume and retinal sensitivity. In eyes with nonatrophic AMD, retinal sensitivity is correlated with the RPE + OS volume, but not the ONL volume or the area or volume of drusen. Depending on the location of those anatomical changes in relation to the fovea, functional visual testing may or may not detect retinal dysfunction. In other words, exclusively extrafoveal lesions will typically not have an effect on visual acuity. In such cases, other functional tests will be required to assess the impact of these off-center lesions on retinal functionality. Previous studies have shown a significant correlation between retinal sensitivity assessed by microperimetry and thickness of the photoreceptor outer segments,2 integrity of ellipsoid zone band,13,14 and drusen volume.13 Microperimetry is also superior to visual acuity in detecting retinal dysfunction in intermediate AMD. In one recent study, one-third of patients had significant sensitivity loss despite good/normal visual acuity,15 and this observation is thought to partially explain the significant visual complains of some AMD patients despite apparent good acuity. More recently, to address this limitation, the Nidek MP-3 (Nidek, Padova, Italy) has been developed and offers a wider dynamic range of stimulus intensities (0 dB to 34 dB). A potential advantage of a wider dynamic range is that may allow for the identification of subtler functional deficits in earlier disease stages. In this study, we assessed the retinal sensitivity in the macula using the MP-3 and correlated this with structural features of AMD evident on optical coherence tomography (OCT). In this prospective study, consecutive patients with intermediate non-neovascular AMD were recruited from Doheny-UCLA Eye Center in Pasadena, CA. Exclusion criteria included the presence of glaucoma, active choroidal neovascularization, diabetic retinopathy, and any degenerative retinal disease. In addition, patients who could not cooperate with the microperimetry examination (eg, patients with movement disorders) were excluded from the study. The study was approved by the institutional review board of University of California, Los Angeles, and written, informed consent was obtained from all patients. The research adhered to the tenets set forth in the Declaration of Helsinki. All participants underwent pupillary dilation with tropicamide 1% and phenylephrine 2.5%, followed by spectral-domain OCT (SD-OCT) volume scans of both eyes (centered on the fovea) using both the Cirrus HD-OCT (Carl Zeiss Meditec, Dublin, CA; 6 mm × 6 mm, 512 × 128 macular cube) and Nidek OCT (Nidek, Padova, Italy; 9 mm × 9 mm, 512 × 128 macular cube). Retinal sensitivity measurements were performed using the Nidek MP-3. Patients were given detailed instructions on the microperimetric testing and were tested by two experienced examiners using a standardized protocol that was similar for all patients. Measurements were performed in a dark room. A red cross was used as a fixation target, and a Goldman III-sized stimuli (0.43°, or approximately 125 μm) with a duration of 200 milliseconds were presented against a white background of 31.4 asb using a 4-2 staircase threshold strategy. The minimum possible intensity of stimuli was 34 dB of attenuation. 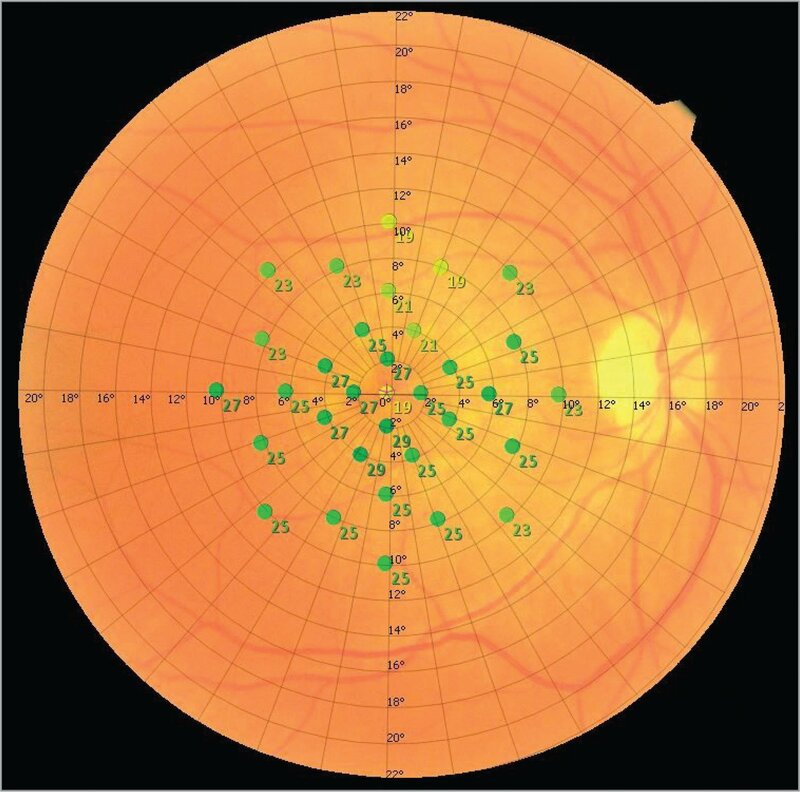 A custom grid designed to assess the macular region was used and consisted of 33 points located at 0°, 2°, 4°, 6°, 8°, and 10° from fixation, which covered a circle centered on fovea with a 6-mm diameter (Figure 1). Result of the microperimetry test on one of the patients. To assess the macular region sensitivity, a custom grid was designed. It consisted of 33 points located at 0°, 2°, 4°, 6°, 8°, and 10° from fixation. The acquired Cirrus SD-OCT images were evaluated using Cirrus review software (version 7.5.0.56). Volume scans were scrutinized to confirm the absence of features of choroidal neovascularization as well as atrophy. 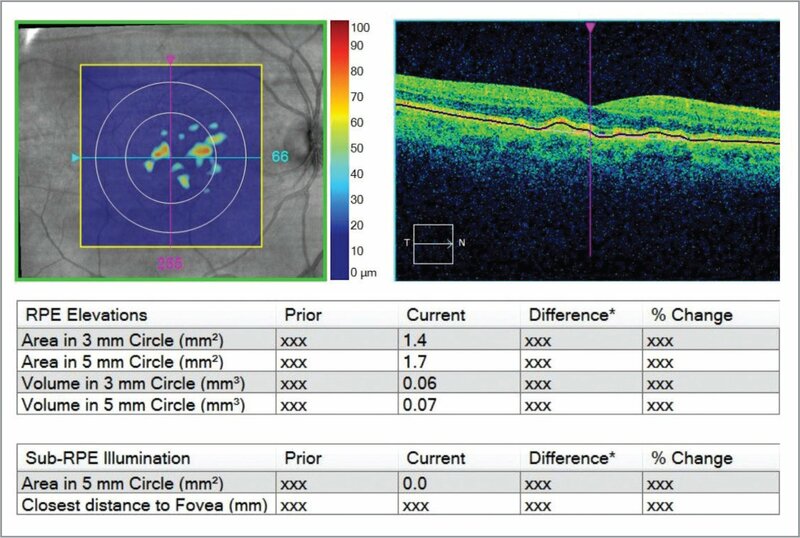 The Advanced RPE Analysis Tool was used to compute drusen area and volume for all eyes within a 5-mm circle centered on the fovea (the standard device output) (Figure 2). Screen shot from Cirrus software illustrating how the Advanced RPE Analysis Tool segments the optical coherence tomography scans and generates drusen area and volume. Nidek OCT images were evaluated using the Navis-EX software (version 1.5.0). The automatic segmentation function was used to compute the outer nuclear layer (ONL) volume and the retinal pigment epithelium and photoreceptors outer segment complex (RPE + OS) volume (Figure 3). B-scans were inspected to confirm the absence of significant segmentation errors. Panel A illustrates automatic segmentation of the retinal pigment epithelium (RPE) and outer segment (OS) of photoreceptor cells (RPE + OS) complex on Nidek optical coherence tomography (inner boundary in green and outer boundary in purple). Panel B represents the volume of the RPE + OS complex on different ETDRS circles based on the automatic segmentation. Only total volume was used in this study. The same elements are shown for outer nuclear layer segmentation on panels C and D.
To find the correlation between the retinal sensitivity and outer retinal layer volumes, the mean sensitivity of all 33 stimulus locations was calculated (the whole area of ETDRS circle). As drusen area and volume was computed for the central 5 mm to facilitate structure-function correlation, the mean sensitivity of only those stimuli that were located within 8° of the center (corresponding to a circle with 5-mm diameter) was calculated. The correlation between mean sensitivity and patient age, drusen area and volume, RPE + OS, and ONL volume was assessed by the Spearman correlation. Significance was set at a P value of less than .05 for the regression analysis. Statistical analyses of the data were performed using commercial software (Statistical Package for Social Science, version 19.0; SPSS, Chicago, IL). A total of 37 eyes from 25 patients with intermediate non-neovascular AMD met the eligibility criteria and were included in the study. The mean age of the subjects was 76 years ± 9 years. The mean sensitivity across the entire tested area of the retina was 24.9 dB ± 2.4 dB. When considering only those stimulus points within 8° of fixation (the 5-mm circle) the mean sensitivity was 25.1 dB ± 2.4 dB. Within the 5-mm circle on OCT, drusen area was 0.7 mm2 ± 0.89 mm2 with a drusen volume of 0.03 mm3 ± 0.04 mm3. RPE + OS volume was 1.96 mm3 ± 0.1 mm3, and ONL volume was 1.91 mm3 ± 0.17 mm3. 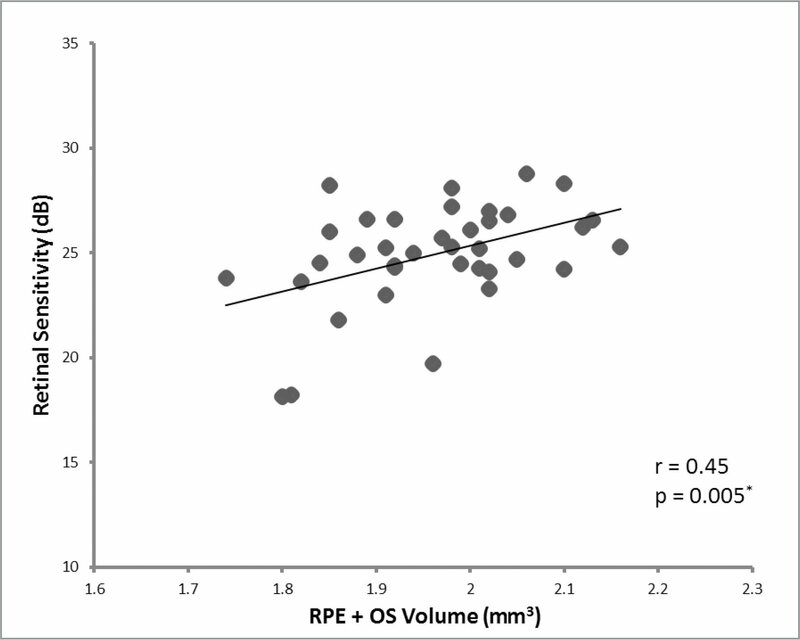 There was a statistically significant positive correlation between RPE + OS volume and retinal sensitivity (r = 0.45; P = .005) (Figure 4), as well as a negative correlation between age and retinal sensitivity (r = −0.48; P =.002) (Figure 5). There was no significant correlation between drusen area or volume and retinal sensitivity. Correlation between the retinal sensitivity (in dB) and volume of the retinal pigment epithelium plus the outer segment of photoreceptor cells (in mm3). 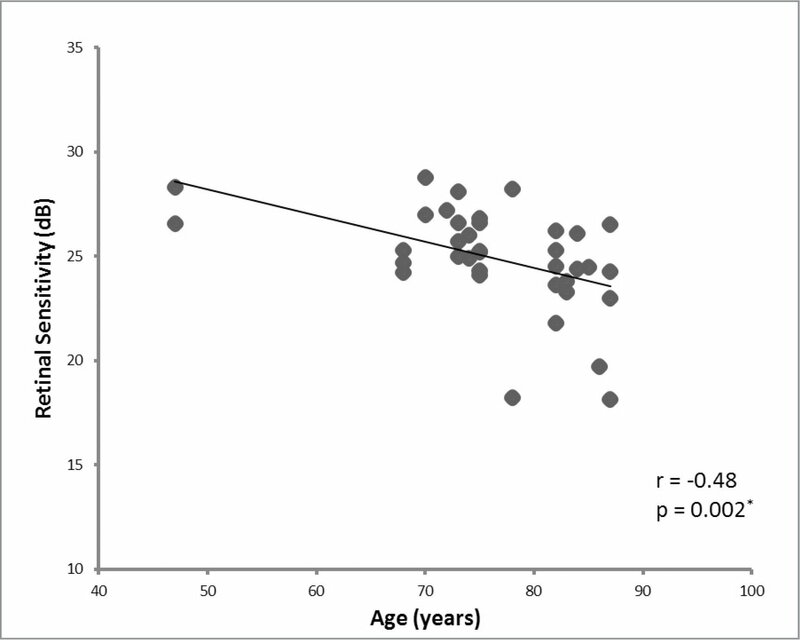 Correlation between the retinal sensitivity (in dB) and patients' age (in years). In this study, we correlated macular sensitivity values as revealed by mesopic microperimetry with quantitative OCT-based structural features in eyes with intermediate AMD. We observed a positive correlation between the retinal sensitivity and outer retinal layer volume, meaning that a thicker outer retina (ie, better photoreceptor preservation) was associated with better sensitivity. Also of note, age was inversely correlated with retinal sensitivity, suggesting that, as AMD patients get older, their functional deficit may increase, even in the absence of features of advanced AMD. In contrast, drusen area and drusen volume did not demonstrate any relationship with retinal sensitivity. 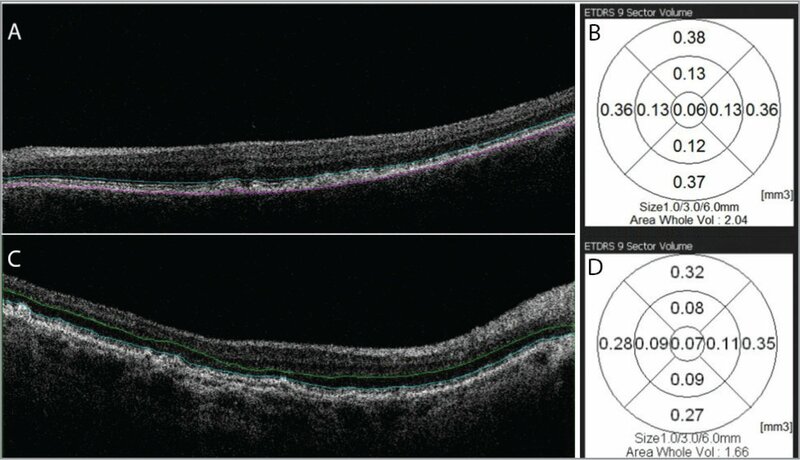 Recent studies, which have performed a point-to-point registration of perimetry and SD-OCT morphology in AMD, demonstrated a correlation between the defect in different retinal layers and retinal function. For example, it was shown that retinal sensitivity changes are correlated to inner and outer retinal layer integrity and to photoreceptor inner segment/outer segment junction integrity.17 Wu et al. demonstrated that only ellipsoid zone disruption and RPE elevation are significantly associated with retinal sensitivity, but not the OS length or RPE thickness, whereas other studies have suggested that OS length is significantly correlated with retinal sensitivity.2 In other studies,18 eyes with confluent soft drusen showed focal areas of reduced retinal sensitivity, which would seem to conflict with our study where no such relationship was observed. However, in that study, the eyes with confluent soft drusen also demonstrated irregularity of the RPE or IS/OS band, which may explain the sensitivity changes. Similar to Nebbioso et al., who studied AMD eyes using mesopic testing parameters, we observed no reduction in retinal sensitivity. They did, however, observe a definite reduction of the retinal sensitivity under scotopic conditions.16 A potential advantage of our study over previous mesopic microperimetry studies is that we were able to utilize a new MP device with a significantly wider dynamic range and more levels of attenuation (0 dB to 34 dB), allowing us to potentially identify more subtle defects than those detected in prior studies. This study has several limitations that should be considered when assessing our findings. Although the microperimetry device that we used features a next-generation, high-speed retinal tracker, during testing, we still observed that not all eye movements could be completely compensated for — especially very rapid microsaccades. Second, although we assessed the impact of drusen, because we did not have permission to obtain fundus autofluorescence or infrared reflectance images, we were not able to assess the impact of pseudodrusen on our observed sensitivity results. Reticular pseudodrusen, however, are thought to have a more significant impact on scotopic rather than mesopic sensitivity,24 and they tend to be distributed in many cases, more peripherally toward the arcades rather than the central macula. On the other hand, our study also has important strengths, including the use of experienced microperimetry examiners and the use of a next-generation microperimetry instrument with higher-speed tracking and a wider dynamic stimulus range. In summary, mesopic retinal sensitivity in eyes with intermediate AMD is reduced with thinning of the RPE + OS complex, but does not seem to be influences by the area or volume of drusen. Age also appears to have inverse correlation with retinal sensitivity in AMD cases that should be accounted for in future microperimetric studies. Curcio CA, Owsley C, Jackson GR. Spare the rods, save the cones in aging and age-related maculopathy. Invest Ophthalmol Vis Sci. 2000;41(8):2015–2018. Villanova L, Vernucci E, Pucci B, et al. Influence of age and physical exercise on sirtuin activity in humans. J Biol Regul Homeost Agents. 2013;27(2):497–507. From Doheny Image Reading Center, Doheny Eye Institute, Los Angeles (TCT, AHH, MA, SS); and the Department of Ophthalmology, David Geffen School of Medicine at UCLA, Los Angeles (TCT, AHH, MA, SS). Dr. Sadda is a co-inventor of Doheny intellectual property related to optical coherence tomography that has been licensed by Topcon Medical Systems and is a member of the scientific advisory board for Heidelberg Engineering. He receives research support from and serves as a consultant for Allergan, Carl Zeiss Meditec, Genentech, and Optos and has served as a consultant for Alcon, Novartis, and Roche. The remaining authors report no relevant financial disclosures. Address correspondence to SriniVas R. Sadda, MD, Doheny Eye Institute, 1355 San Pablo Street, DVRC 211, Los Angeles, CA 90033; email: SSadda@doheny.org.